The Bocydium globulare, commonly known as the Brazilian Treehopper is a fascinating insect that roams many regions of our world. I would like to start off with a few fun facts regarding this insect. This particular treehopper belongs in the order Hemiptera; if we want to go more in depth, it also belongs in the family Membracidae. Membracidea is a wonderful family to be apart of because of their diversity and how widespread they are. Now that we know the hierarchy of the Brazilian Treehopper, we can move on to the fun stuff! To start off, it is not commonly to only one area but to many around the world. Although this is the case, it tends to stay in warmer, tropical regions, such as North America, South America, Australia, Africa and Asia. After further examination, entomologist discovered only three species are known to range in Europe. How fascinating! This is a very common species to all of these regions, minus Europe and have never been on the endangered or threatened species list. This is very exciting but not only are they common but they have been evolving for many years. 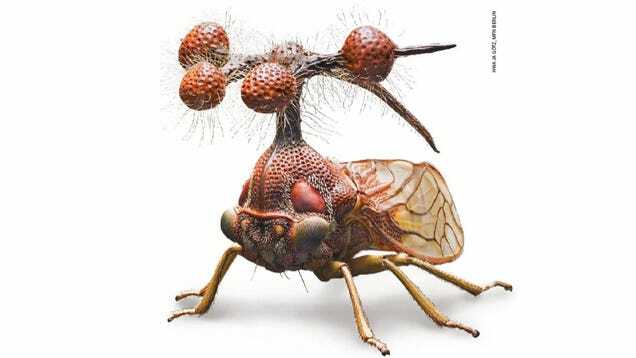 If we want to be exact, the Brazilian Treehopper has been around for nearly 40 million years. We know this because entomologist were digging around in the Dominican Republic when they found fossils of these insects on pieces of amber. Its interesting to know that entomologist have been analyzing the treehoppers DNA and found that their closest relative is actually the leaf hopper. This particular species lives a pretty chill lifestyle in the fact that they don’t really do very much. The larvae’s primary source of food comes from the underside of leaves. To be more specific, the Brazilian tree hopper larvae feeds on the sap of leaves making it a sap-sucking insect. They tend to stay near the tops of the tree where there is plenty of vegetation to eat. Not only are plants used as their food source but also plays a vital role in their life cycle. The female treehopper has two choices when laying her eggs. She can either insert it into the plant tissue or simple lay it on the surface of the plant. There are so many species of treehoppers and each species differentiates by a little factor so it doesn’t make since to go into our species when we can make generalization. It was also difficult finding exact female reproduction modes for this species. For example, in some species the females guards her eggs until they hatch, while other leave them. Some of these insect eggs are protected by ants, which care for them and in return the treehopper produces a honey-dew for them. 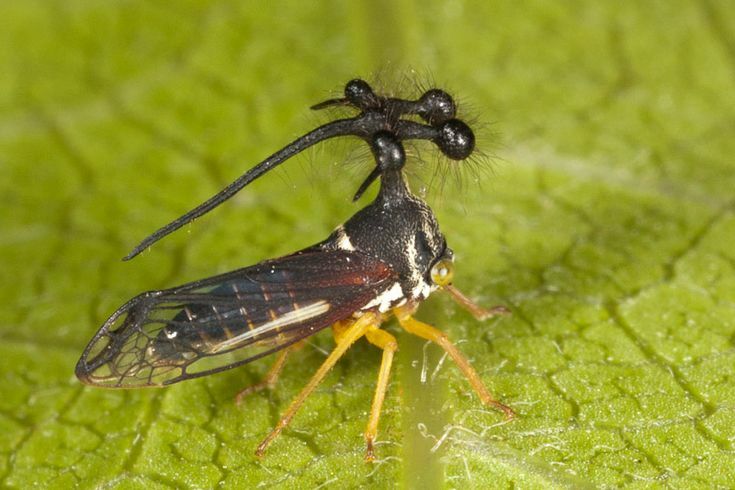 The Brazilian Treehopper has a hemimetabolous development and for those of you who don’t know what that means, its just a fancy way of saying it starts off as an egg, then grows into a nymph and finally enters the adult stage. What is so interesting about this insect is what is carries on its thorax. It has 3 balls attached to one another sticking straight from its thorax. After doing further research, many entomologist have no idea what this ornaments function is but some suspect it might have to do keeping away predators or detecting predators. A lot of information is known about this insect but there is still a lot of questions that need to be answered, such as why it prefers warmer climates, what the ornaments function is and so much more. Maybe one day I will be the one to figure those out. Who knows! 3. L. L. Deitz, M. S. Wallace, C. H. Dietrich, S. H. McKamey, and M. J. Rothschild, 14 July 2010 (revised 22 August 2011).